The purpose of the study in this year was to investigate the effects of rest and work on cerebral blood flow and cardiovascular hemodynamics during short staying at Mt. Fuji (3,776 m). Nine adults participated in the study. Three of 9 subjects underwent a 4 consecutive days of experiment, sea level (SL, Gotemba, 500 m), at 1st to 3rd day during stay in the summit of Mt. Fuji (Day 1, Day 2, and Day 3). The other 6 subjects underwent one experiment during stay in the summit of Mt. Fuji (at 2nd to 15th day). During supine rest and standing rest, 5 min data was collected. Then, subjects performed a stair stepping exercise (step height, 30 cm; stepping rate, 15 steps/min) for 3 min. After exercise, 5 min data was collected again during subjects kept supine rest. We measure heart rate (HR), systolic and diastolic blood pressure (SBP and DBP), arterial oxygen saturation (SpO2), changes in oxyhemoglobin and deoxyhemoglobin concentration, and also tissue oxygen index (TOI) and tissue hemoglobin index (nTHI) at left frontal cortex area and at right middle vastus lateralis. 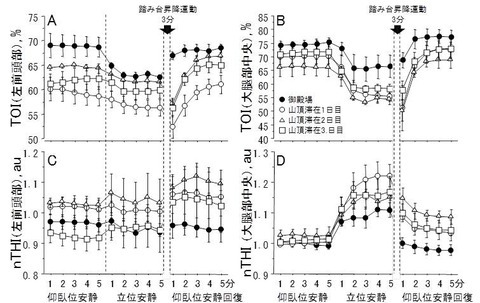 We found that HR increased at Day 1, and further at Day 2 and Day 3 compared with SL throughout the protocol. SBP and DBP remained unchanged at Day 1, while increased at Day 2 and Day 3 compared with SL throughout the protocol. SpO2, and TOI at both sight decreased at Day 1 to 3 compared with SL but it gradually recovered at Day 2 and Day 3 throughout the protocol. These responses were pronounced at 1 min after exercise. nTHI at right middle vastus lateralis increased at Day 1 to 3 compared with SL throughout the protocol. 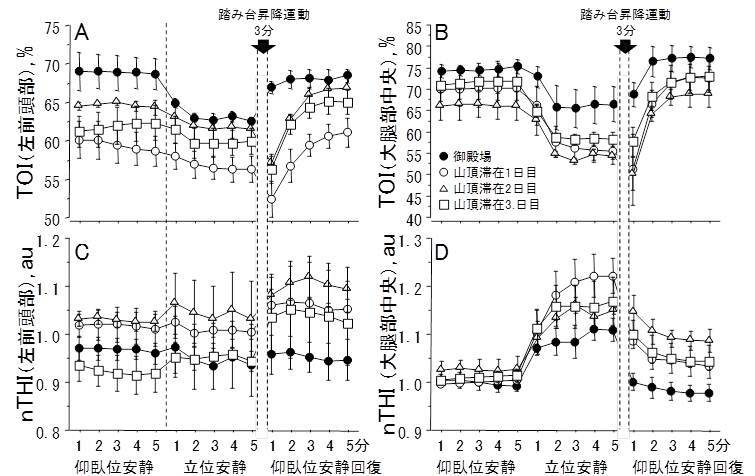 On the other hand, nTHI at left frontal cortex area increased at Day 1 and Day 2 compared with SL throughout the protocol, whereas it recovered to SL level during supine and standing rest while increased at supine rest after exercise at Day 3. Thus, increased nTHI, which is a measure of tissue blood volume or vasodilation, at brain may be a possible mechanism of headache and acute mountain sickness during stay and exercise at high altitude. 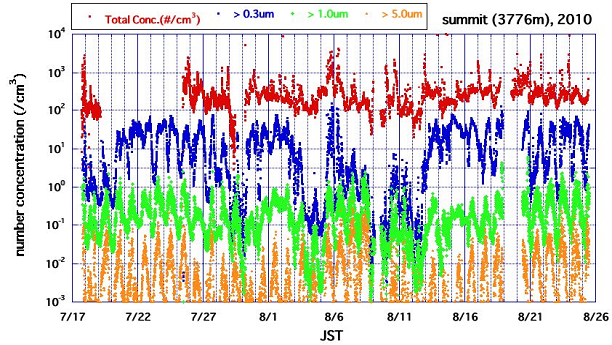 National Institute for Environmental Studies (NIES) had a year round automatic CO２ measurement on the top of Mt Fuji since August, 2009. The data is daily sent to NIES in Tsukuba. Ibaraki by satellite data communication. This year, after the first year of the measurement, we aimed to develop and improve the system and prepare for the second overwinter observation. Another task this summer was to recharge 100 sealed zinc batteries automatically between our first and second visits. We transferred those batteries to the summit last year as the power for the CO２ measurement system to run for about 11 months. We charged them successfully with new systems we developed which use only two battery chargers for 100 batteries. We resolved a problem with satellite data communication by decreasing the amount of data to send last summer. However it was better to improve the system to be able to send all the measured data without any delay. For that, we developed another system (Fuji-2) similar to the first version (Fuji-1), that adopted another satellite data transfer service called Iridium. 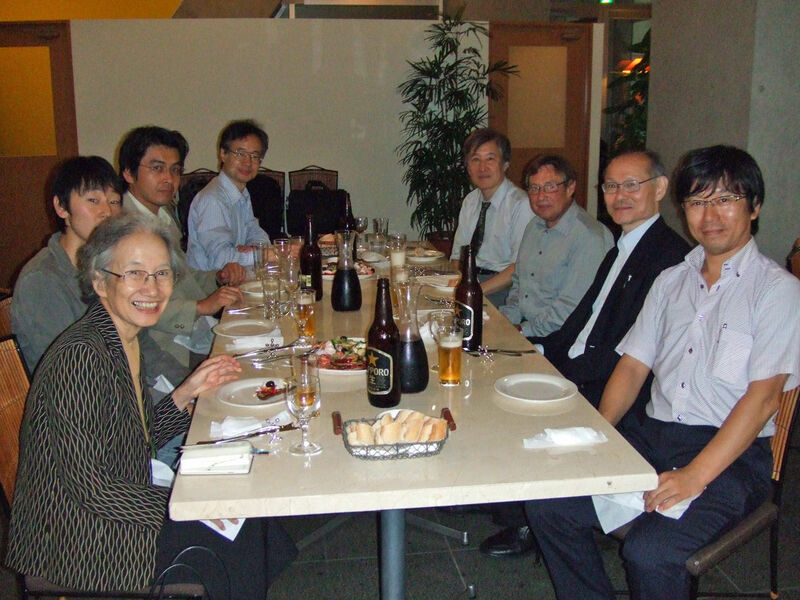 We had an experimental measurement with Fuji-2 during the summer for two months. At last we prepared the whole system for the second year of unattached automatic measurement through the winter. 所　属： 株式会社MTS雪氷研究所　MTS Institute Inc.
New three-dimensional rain gauge (3D rain gage) was developed by authors aiming at the measurement of the direction and the quantity of raindrops falling under strong wind conditions. A tipping bucket type rain gauge had been once installed on the top of Mt. Fuji, and was dismantled due to the difficulty of catching raindrops rising with the ascending wind along the slope. The purpose of present observation is the verifying the availability of 3D rain gage even under the worst wind conditions of Mt. Fuji and its measurement accuracy, in comparison with the data of tipping bucket type rain gage and of three-dimensional anemometer installed beside the 3D rain gage. During one and half months observation at Mt. 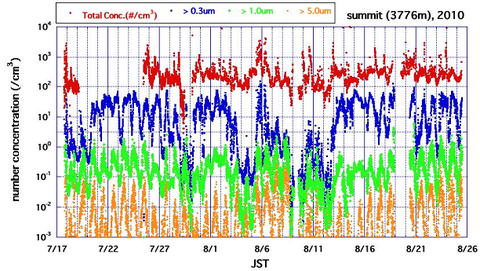 Fuji, 3D rain gage run in nine times of rainfalls and recorded total 41 hours of rainfall. Results obtained are; 3D rain gage was available for Mt. Fuji, it recorded more amount of rainfall compared with tipping bucket type rain gage, and the falling directions of raindrops are harmonious with the three dimensional wind vectors. Fig.1 Variations of number concentration of total particles, particles larger than 0.3, 1, 5 um in diameter measured with SMPS and OPC. Size distributions from 4.4 nm to 5000 nm in diameter were measured with a scanning mobility particle sizer (SMPS, TSI 3936N25 or 3936L22) and an optical particle counter (OPC, RION KR12), at the summit (3776m, 35.36N, 138.73E) and the base Tarobo (1300 m) between 17th July and 25th August 2010. Sample air was dried to lower than 20% with a diffusion dryer. Variations of number concentration of total particles, particles larger than 0.3, 1, 5 um in diameter measured with SMPS and OPC were shown in Fig. 1. Particles larger than 300nm with the OPC showed a clear diurnal variation, high in the daytime and low at night. This suggests that the origin of these particles was in the boundary layer. Concentrations of cloud condensation nuclei (CCN) and small ions were firstly measured in the summit at this year. We analyze the relation of the CCN and the size distribution, and the relation of the small ion, ionization, and aerosols.